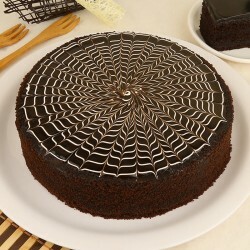 The mere thought of having a chocolate cake gives you goosebumps. Just imagine what impact it would have if you order it for your loved one on their special day. Book this sweet delicacy and surprise your precious ones by creating an alluring experience every single time! 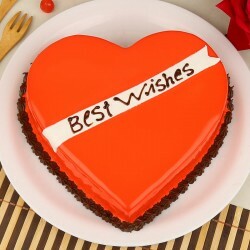 There are at least hundred great varieties of cakes baked in the world today. There is the beloved Vanilla pineapple Cake, there are these colorful rainbow classics that grace many of our birthdays, and of course the butterscotch, strawberry and coffee which have different fans of different age groups. We love them all, somewhat because they are all cakes that make the world a better place, but largely because they taste scrumptious. But no matter how much we like all of these differently flavored cakes, at the end of the day what we really crave is chocolate! Chocolate cake comes in many shapes, textures and sizes, all adorable and obsessing. 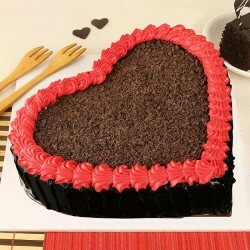 The world loves chocolate cakes, which is evident by the fact that there is a food holiday dedicated to this single cake type on the 27th of January every year. 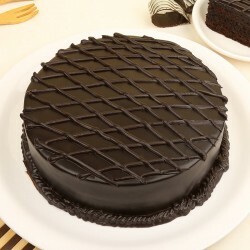 In case you love chocolate as much as the world does and wish to celebrate the day, which you obviously should, you are at the right place where you can easily order chocolate cake online. How and when did Chocolate cakes begin? 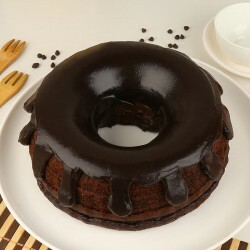 The history of chocolate cake goes back to the year 1764 when it was discovered that chocolate could be made by grinding cocoa beans between two heavy millstones. This ground cocoa powder, until the 1900s, was consumed primarily as a beverage. A process for making chocolate into a silkier and smoother liquid was developed and termed conching. Conching of chocolate made it easier to bake with it as the amalgamation got smoother and easier. However, people still continued to define chocolate as a liquid treat until the beginning of the 20th century when chocolate was beginning to be used in sauces and frostings. It actually took the Chocolate Cake a lot of time to be recognized as we think of it today. However, once recognized, it transformed chocolate from an exclusive treat to a daily nosh, and most people started baking Chocolate cakes in their homes. No wonder chocolate is a love staple today it is delicious, romantic and good for you; what better gift for someone you love? 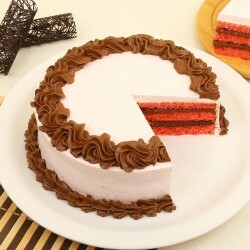 From the early Europeans who considered chocolate cakes a food fit for the gods, to the modern chocolate fanatics who believe that chocolate cakes can serve as a love potion, not a lot has changed overall these centuries except for the fact that ordering a chocolate cake online is simpler than ever! The rich, creamy flavor of the chocolate layered on a spongy base, chocolate cakes are primarily loved because they taste so good. Every time we taste chocolate, it is a wonderful indulging experience. 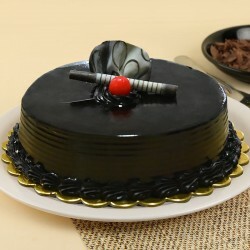 If it's an occasion you wish to order a cake for, chocolate cakes are a win-win because you know everybody will like it. 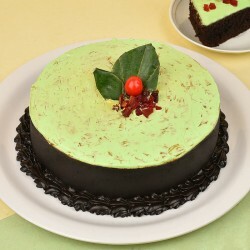 Chocolate cakes are a great way to satisfy our innate fondness for sweets and are an important part of every occasion these days. 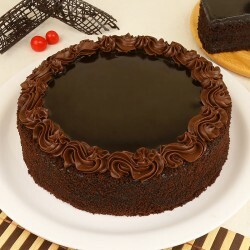 Chocolate cake is a real feel-good delicacy, and there are so many different types of chocolate cake available out there to pick and choose from. 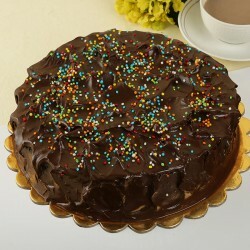 There is the unadulterated truffle, the classic cake with chocolate icing, and the soulfully rich mud cake. Then there's Belgian chocolate, chocolate mousse cake and the ultra-sleek chocolate fudge that occupies a place on most fine dining menus. 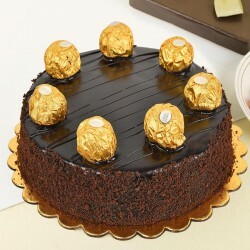 You can even choose from the classic chocolate flavors turned into cakes such as the KitKat and Ferrero Rocher cakes, which are often a hit among the children. 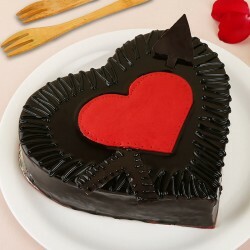 Then there are heart shaped and photo printed cakes that help add a personal touch to cakes, making them ideal as a birthday cake or an anniversary cake. 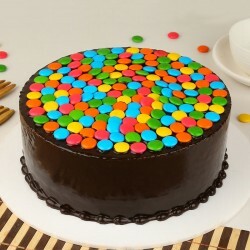 Why go for Chocolate Cakes? Until you scoff at it(which we hope you don't! 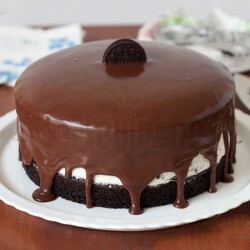 ), there is a host of proven ways in which chocolate cakes can be good for you. 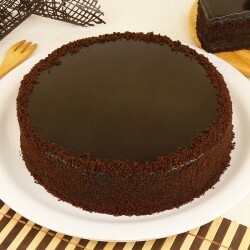 Chocolate cakes trigger the release of endorphins in our body which make us feel good, and mildly elevate our mood. Chocolate's creamy texture backs its sensual quality, which is why it makes for a great bite when we feel happy or in love. Avery latest research suggests that eating chocolate could help keep your brain function whirring into old age. Dark chocolate is known to cure diseases and promote a healthy and happy life. While you manage guests and arrange for the party props, let us take care of the cake. 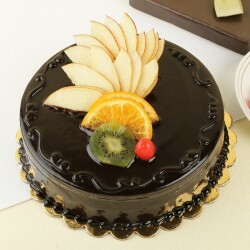 We have an extensive range of chocolate cakes for online order. Need customizations? We've got that covered as well. Our on-time chocolate cake delivery will ensure the center piece of your party is there on time and in a perfectly fresh condition. 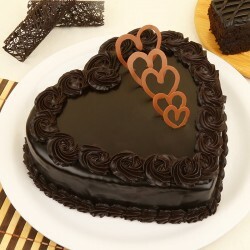 You can also opt for a same day delivery cakes or midnight gift delivery for your chocolate cake through MyFlowerTree. Products in this category have been rated 4.8 out of 5 based on 143 reviews.